Build a complete customer journey from the apps and tools you already use. Find out how to connect Paldesk with a Facebook page. Learn how to connect Twitter to Paldesk and increase your conversion rates. Read up on how to connect your email account with Paldesk. By integrating Paldesk Live Chat with Slack, you will get chat related notifications on Slack for events like new chat requests, chat accepted, chat ended, missed chat and offline messages. Only an Admin user has access to Slack application integration. How to integrate Zapier with Slack? Step 1: Login to Paldesk application. Step 2: Go to ‘Administration’ → ‘Integrations’. Step 3: Click ‘Slack Agent Assistant’. Step 4: Click ‘Add to Slack’ button. Step 5: Click the ‘Authorize’ button. After, you will be redirected back to Paldesk. Step 6: Press on ‘+’ in the upper right corner and select the Slack channel where you want to get Slack notifications from Paldesk Live Chat, choose associated group and click ‘Create’. Step 7: Now your Slack account and Paldesk Live Chat Account is connected successfully. That’s it! Now your agents can get notifications in real time, enjoy. 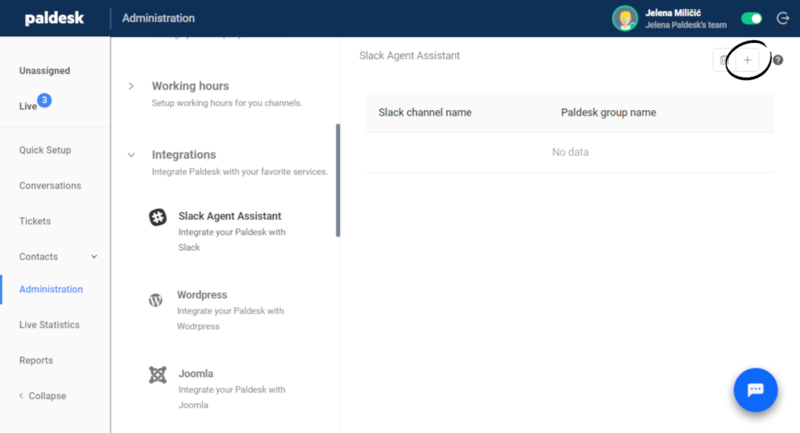 From Paldesk app, under ‘Administration‘ -> ‘Integrations‘, choose ‘Slack Agent Assistant‘. In the upper right corner is option ‘Delete‘. After you click on this, you’ll get the confirmation question. After you remove Slak app, you’ll be able to reauthorize the app.